That was RCA’s slogan for Bowie’s “Heroes” album. The single was released on September 23, 1977. The album followed on October 14th. The single, amidst a backdrop of punk rock and Disco peaked at No. 24 in Britain. It didn’t even make the Top 100 in America. The week after Bowie’s passing in January 2016, the song hit No. 12 in the UK. 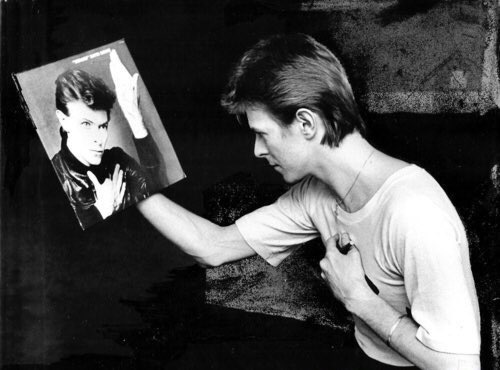 Bowie’s “Heroes” is one of the most poignant songs of all time. The song was written “In Berlin, by the wall” – a setting right out of a Lou Reed song. It was originally an instrumental. The title references the 1975 song “Hero” by the German band Neu. The song’s motorik beat was pioneered by the drummer of another German band, Can (Jaki Liebezeit). 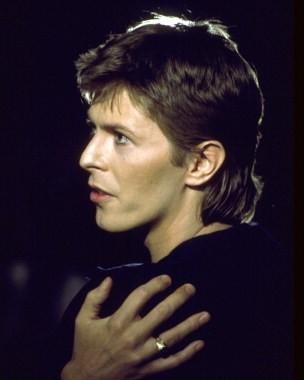 Yet Bowie utilizes the beat as though he is playing the Velvet Underground’s “I’m Waiting for the Man”. The result is dreamy, floating, whirring and ethereal. Mid-song as the music swells, there is an octave jump (an uplifting effect also used in another tune of escapism, “Over the Rainbow” which Bowie previously referenced in “Starman”). As the verses build, Bowie’s voice becomes increasingly frantic, shouting, defiant, victorious! The song makes us feel sublime, fearless and triumphant – but ‘Heroes’ is really a heartbreaking love song. It is an unyielding yet impossible vow to be together with the person you love, amidst oppression, obstacles and the transience of love, of time and of place. 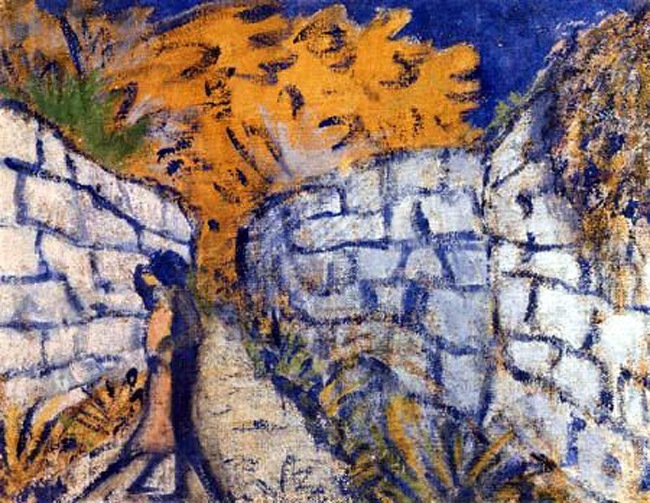 This verse was inspired when David saw the Otto Mueller painting hanging in Die Brücke Museum, Liebespaar Zwischen Gartenmauern (Lovers Between Garden Walls), as well as when he saw producer Tony Visconti illicitly kissing a woman at the wall outside the studio window. Then, due to his unfulfilled yearning, our spirited singer is consumed by self-doubt. He revisits mortality, bleak reality and endless oppression in the last verse. His infinite timeline of ‘forever and ever’ is conceded to ‘just for one day’. The defeating line ‘we can be us’ suggest that as lovers or as a people, we remain puppets of war, of governments and victims of our own making, despite our delusions of grandeur. A stunning black and white Sukita photograph of Bowie in a pose inspired by the paintings of Egon Schiele grace the now iconic cover, with the album title in quotation marks, deflating the word “Heroes”. With Brian Eno’s EMS synthesizer and his Oblique Strategies for guidance, the dazzling warped guitar wails of Robert Fripp’s guitar and incredible production tricks by Tony Visconti, ‘Heroes’ is a unique song (and album) even by Bowie standards. The rest of the band were Dennis Davis, Carlos Alomar and George Murray (the D.A.M. Trio who also graced Bowie’s albums Station To Station and Low). I’ll never forget that. It was one of the most emotional performances I’ve ever done. I was in tears. They’d backed up the stage to the wall itself so that the wall was acting as our backdrop. We kind of heard that a few of the East Berliners might actually get the chance to hear the thing, but we didn’t realize in what numbers they would. And there were thousands on the other side that had come close to the wall. So it was like a double concert where the wall was the division. And we would hear them cheering and singing along from the other side. God, even now I get choked up. It was breaking my heart. I’d never done anything like that in my life, and I guess I never will again. When we did “Heroes” it really felt anthemic, almost like a prayer. However well we do it these days, it’s almost like walking through it compared to that night, because it meant so much more. However well we do it these days, it’s almost like walking through it compared to that night, because it meant so much more. That’s the town where it was written, and that’s the particular situation that it was written about. It was jus extraordinary. I was so drained after the show. It was so wonderful. “…The tattoo on the back of my leg was done in Japan (1991), as a confirmation of the love I feel for my wife and my knowledge of the power of life itself…but it does have a dolphin and a Japanese variation of the Serenity prayer among the content. I drew it myself and then had one of Japans tattooists ink it for me…The dolphin has always had a real significance for me. The dolphin reference came from a book I had read many, many years ago called ‘A Grave For A Dolphin.’ A young European traveler finds himself stranded in an African village situated near the sea. By day he befriends a dolphin, and at night, falls in love with a beautiful but elusive girl who, he presumes, comes from the village. In short, the girl disappears one night and the next morning he finds the dolphin has dragged itself across the sand and up to his hut to peacefully die. Thank you for the nice comment Dieter! What was the name of your band? ← So long ago – Was it in a dream?